Last Friday night, the Logan Center hosted a packed opening—the Department of Visual Art’s B.A. Thesis Exhibition, “Yummy Yummy.” The first floor was brimming with students animatedly examining the projects of nearly a dozen fourth-year students. Against a disco soundtrack of Breanne Johnson’s Untitled (Multimodal), the artists displayed photo collages, displaced patches of lawn, a tank of goldfish, and a “KINDBOY Host Club,” tucked in the back corner with pink fleshy bubble wrap covering the walls and floor. The first installation, Juliet Eldred’s photographic tapestry of satellite imagery, hangs on the exterior wall of the exhibit. 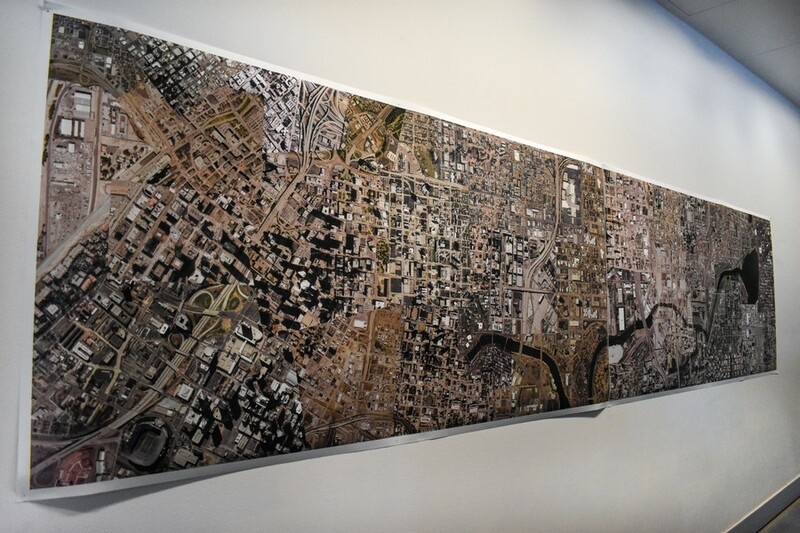 While the piece, titled Ground Truth, initially appears to be a coherent image, a closer inspection reveals that the photos are arranged to connect transit lines across image boundaries. “I’ll have a highway run into a river, or railroad tracks run into a highway,” Eldred said. Inside the gallery—on the opposite side of the same wall—there are prints of interior spaces that Eldred found on the site InstaCam, which constantly gathers video footage from unsecured surveillance cameras. The prints provide glimpses into owl habitats, suburban streets, and more. The two opposite perspectives speak to different conceptions of surveillance, an insight that Eldred attributes to the curation process, when the B.A. students decided how to arrange their works within the space. Nicholas Jiwoo Hahn’s "Black Korea" installation evoked a run-down bodega with a live grainy surveillance feed of the gallery visitors. A variety of large installation pieces occupy the gallery space. 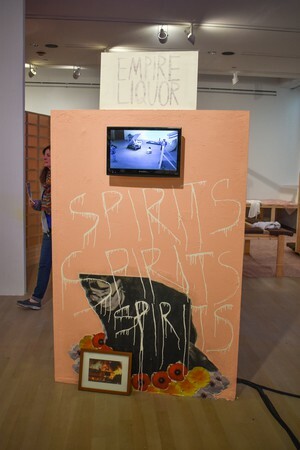 The live security camera feed of the gallery’s observers and an “Empire Liquor” sign of Nicholas Jiwoo Hahn’s Black Korea, evoke a run-down bodega surveillance setup. Next to it stands a piece of Kenneth Zheng’s It Will Be Lost to the Sea & No One Can Stop It—images projected onto the water of a live goldfish tank. Over the speakers, Zheng tells the story of the goldfish that, like him, originate in China but live in Chicago. To Zheng, goldfish represent many things: the globalization and importation of Chinese culture, childhood, and, ultimately, the diaspora of the Chinese-American community. On the wall above the tank, a series of intricate ink drawings, Zheng’s Divorce Machines, describes a schematic of mechanisms to cope with divorce, both legal and emotional. “They’re very narrative-driven,” Zheng said. The drawings overflow with minute details, such as a Versace chair and a lucky cat figurine. 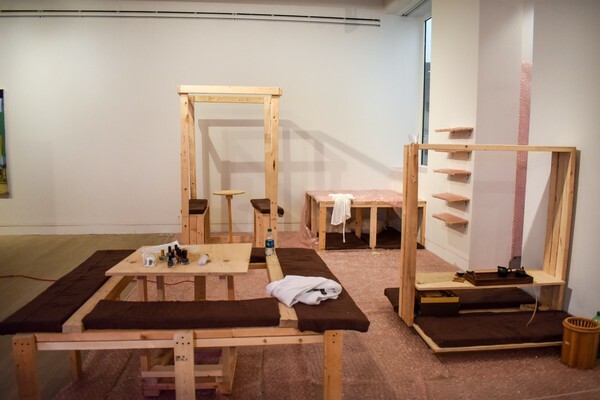 Occupying the back corner of the exhibit is the KINDBOY Host Club, a joint project by B.A. student Angela Lin and third-years Keely Zhang and Sophia Sheng. The Host Club (which will be open frequently during the span of the exhibition) is accessed through a side entrance, where a Host Club guide asks guests to remove their shoes before moving through a tunnel of pink bubble wrap, called “the throat.” Guests may then pick a host to entertain them. "KINDBOY Host Club" by third-year students Sophia Sheng and Keely Zhang, and BA student Angela Lin. The exhibit draws on the tradition of Japanese host clubs, where male hosts entertain female guests as their dates. At this club, hosts serve tea, paint nails, or tell fortunes. Lin, Zhang, and Sheng designed this club to address questions of Asian masculinity, intimacy, and disillusionment. After participating in the project as a “Kind Boy,” Zhang noted how the trauma of performing for the hosts, whose simplistic personas—ultimately culled from their real personalities—could not be entirely separated from the participants themselves. When I visited walked through the installation, the bubble wrap in the “throat” of the club had already been trampled by previous guests, and people were gleefully attacking the bubbles on the walls. After getting my nails painted, “Breezyboy” handed me a twist of rope, meant to represent a piece of his heart, which I could take with me or return his glass jar (labelled "Breezyboy") so that he could be redeemed from the club. As fun as the experience was, the fragility of the surroundings left me feeling implicated and disturbed. “Yummy Yummy” includes works by Juliet Eldred, Jurrell Lewis, Nicholas Jiwoo Hahn, Gabby Davis, Alex Whitmore, Kenneth Zheng, Angela Lin, Breanne Johnson, Gwen Kouen Seol, and Chak Hon Ambrose Iu. It will be open until April 23 on the first floor of the Logan Center.